Years ago, a boxing champion named Mammoth was exiled and imprisoned. Now, a decade later, Mammoth is ready to return to the family, title and country he’d left behind. It’s a land in which man, beast and champion stride a battlefield and either raise their gloves in triumph or taste canvas in defeat. But before he can return, Mammoth has to escape. And every escape has a story. This, then, is the beginning of that story. 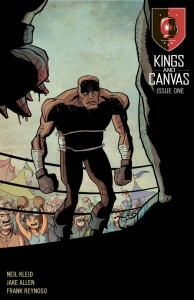 KINGS AND CANVAS, an original boxing fantasy tale, explores the lengths a man will go to find purpose after life, liberty and career have passed him by. “Game of Thrones meets Rocky”-but with sea dwarves, pirate referees and talking, boxing dragons-KINGS AND CANVAS journeys across the frontier of a changed America in which honor is gained not by using guns or swords, but rather fists, wits and the courage to change. With these words, spoken with reverence in an America that holds no resemblance to our own, an almost holy pact is sealed between two fighters. In this world, the sweet science of boxing is held as a sacred art, practiced by champions and overseen by incorruptible monks instead of referees. Among all the races, humans, trolls, dwarves, and even dragons, the single common thread is the unassailable regard held for the fair and honest challenge, to be carried out on holy canvas. 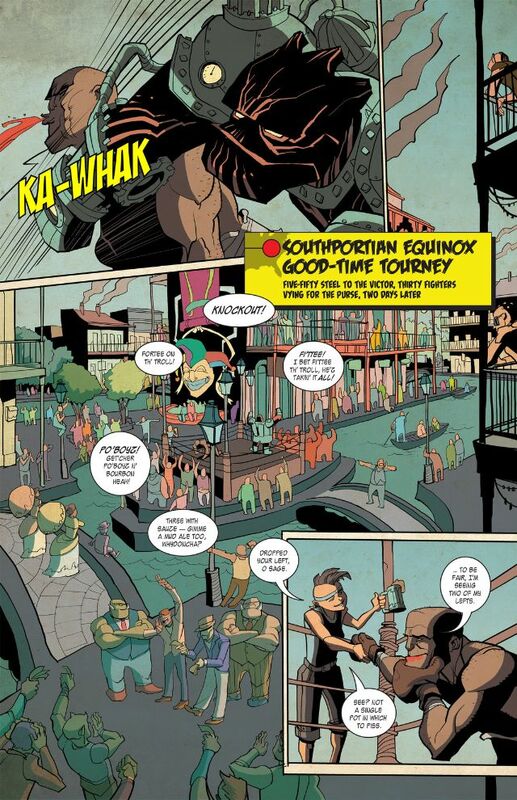 The story starts, way back in issue #0 (issue #2 due out in early January) with Mammoth, an exiled prisoner serving his sentence in Gaol, the largest of the prison cities. Here the inmates work all day, mining and scavenging for remnants of steel, the highest currency to be found. Mammoth works without complaint, occasionally spinning a story for his fellow inmates to pass the time, seeming content to pass his time quietly under the scrutiny of his guards. But since that kind of thing makes for a really boring story, the day comes that Mammoth realizes he’d been mistaken. The “guards” aren’t what they seem… in fact they’re nothing more than inmates who’ve gotten hold of weapons, and placed themselves in the position of authority. Staging an escape, Mammoth finds himself on the road and with a destination firmly in mind. He means to make his way back West, to home and a certain someone he’s determined to be reunited with. 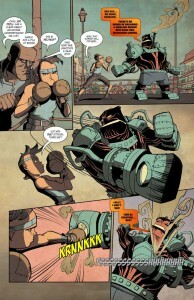 Along the way, Mammoth meets up with a girl named Nik, someone in whom he sees the potential to be a champion. The two go from city to city, fighting in every tournament they find along the way, building a bond as trainer and boxer and learning from each other. Wait… boxing dragons? Boxing as a sacred challenge? Yup, I know. 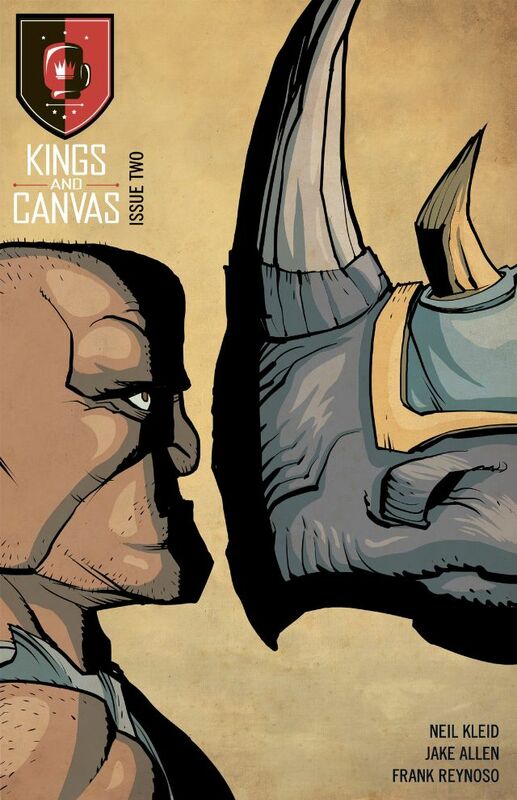 When I first heard the concept behind Kings and Canvas, I thought it was a little out there, even for me. I settled in for a read, expecting maybe some witty satire. 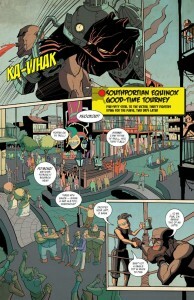 What I got was one of the most well-written comics I’ve had the pleasure to read in a while. I’m serious, Neil Kleid’s writing is almost lyrical in its composition. His characters are individual, unique in more than just appearance, and their dialogue ranges from outstandingly written cockney to near-poetic soliloquies about the “sweetest science”. 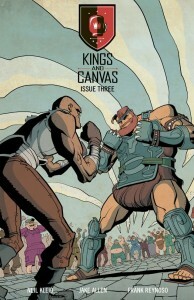 The art by Jake Allen is just stylized enough to make the premise of the story easier to swallow… This is, without a doubt, high fantasy set in a land where boxing trolls and talking polar bears is the norm. The action has a smooth flow to it, with a single panel depicting a punch/evade/counter in one fluid shot that loses nothing in the translation from motion to page. My bottom line here, without wanting to sound like I’m gushing, is that this is definitely a book you’d want to start with no preconceived notions of what it might be. 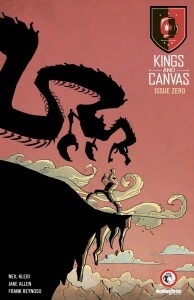 It’s unique, and if nothing else that should make it worth a look (come on, ninety-nine cents an issue is a steal!). Having read issues 0, 1, and a preview look at 2 (issue 3 to be released on Jan 13th), I can honestly say that Kings and Canvas might easily be one of my new favorite comics.